This is going to really show my age, but how many of you remember “Alice” the housekeeper from the Brady Bunch Family TV show? You never really got to see her doing much cleaning other than light vacuuming and constantly wiping down the kitchen counters with a snow white cleaning cloth. If Alice did any strenuous activity she would “throw her back out” and have to rest. Not a bad gig if you ask me. Still, I wouldn’t mind having an Alice of my own who managed the impossible task of keeping kitchen counters sparkling clean every day, all day long! The reality is, it’s not going to happen. Our kids are pretty good about doing chores and helping out. But the bottom line is, I’m the Alice in our house, always wiping the kitchen counters down. 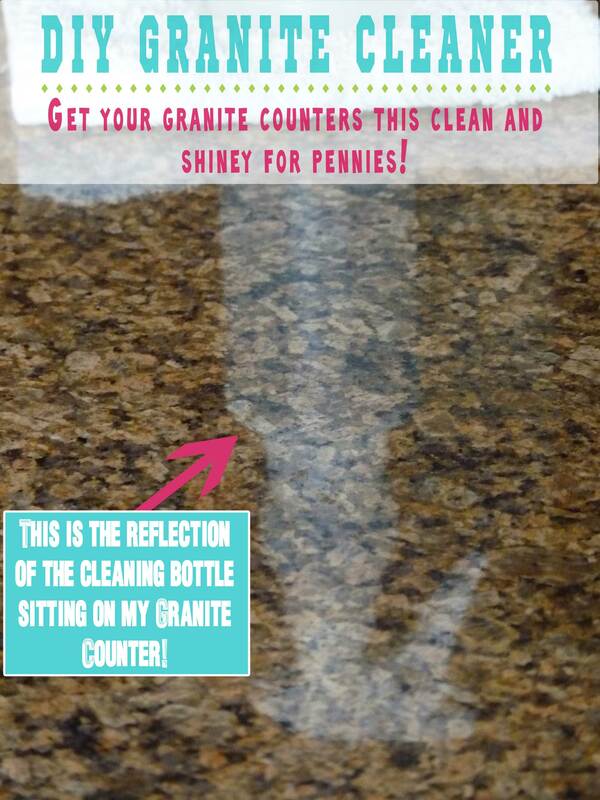 Keeping granite counters clean is costly. I’ve always been afraid to use anything other than the “recommended” commercial cleaners because I worried about stripping off the seal and damaging the surface. So when I saw this “DIY Granite Cleaner” from Melissa at No. 2 Pencil I knew I wanted to so some research to make sure it was safe and then give it a try. Here is what you need to know about safely cleaning granite, marble and stone surfaces. These surfaces do NOT do well with acidic (citrus-based) cleaners. The vinegar or citrus can actually cause what looks like “etching” on them. 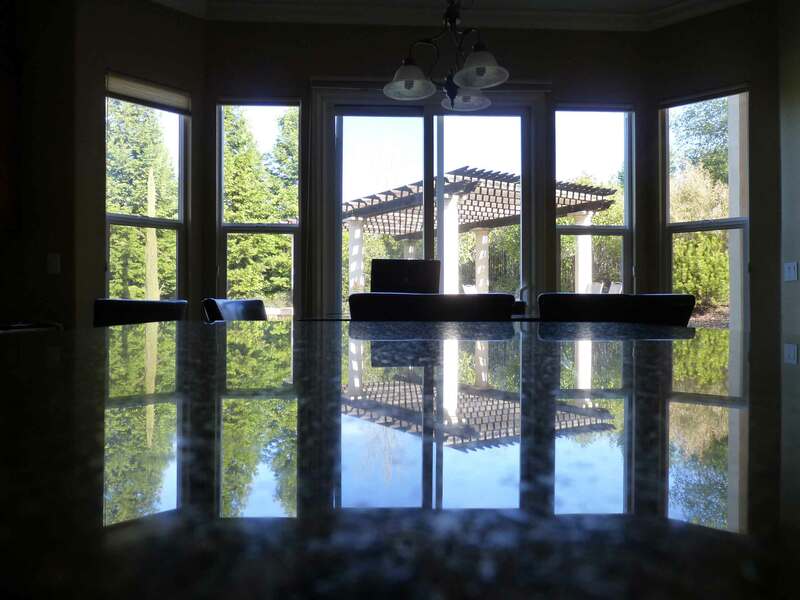 Windex is another no go, it will quickly strip the “seal” off of your granite/stone. You are now left with two options, expensive over the counter products or make your own. I chose this recipe because it is the one most seen on Pinterest. They all have the same ingredients, water, rubbing alcohol, dishwashing soap and essential oil. 1/4 c rubbing alcohol, 3 drops dishwashing liquid, 2 cups water, 5-6 drops essential oils. Place them in a cleaning bottle, mix gently and you are ready to go. I first cleaned off any “sticky remains” from the counters with a damp rag, let them dry and then used the granite cleaner and a clean, dry cloth. First thing I noticed was the smell of the alcohol, which I didn’t like. I had just finished the counters when Sherri called. I glanced back at the counters before answering the phone. They were still wet and looked like they were going to streak. I was disappointed because I really wanted this to work. I chatted with Sherri for about 20 minutes and walked back into the kitchen. I found my counters dried beautifully without any streaks or alcohol smell! They were so shiny that you could see the reflection of my backyard and the cleaning bottle on the counter top. I took the following pictures by setting my camera on the counter and pressing the button. If you don’t think that is “perfect” shine, then I’d suggest getting your eyesight checked! 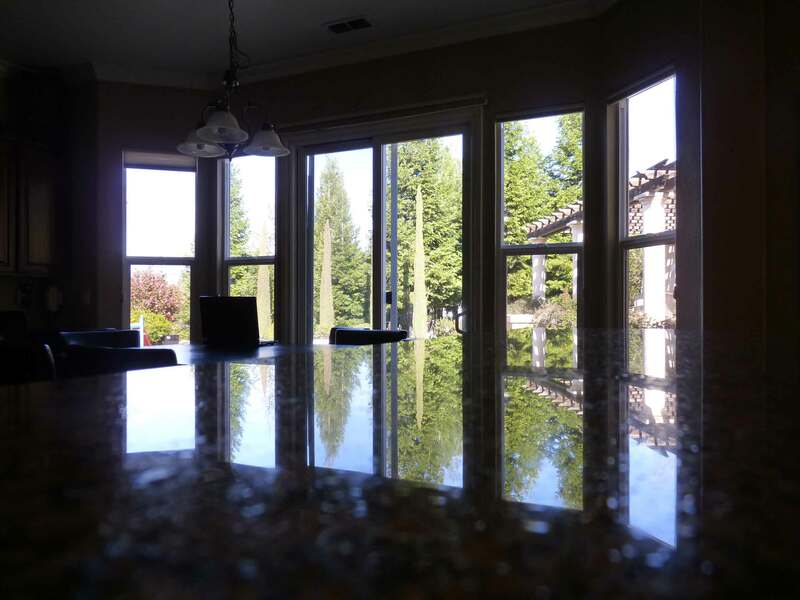 Not only are my counters gorgeously clean but it only cost me a fraction of the price! I will NEVER go back to an over the counter granite cleaner again, I’m happy to report that…..
“The citric acid in lemon juice is what causes lemon juice to be acidic. Our lemon essential oil does not have any citric acid, therefore it will cause no acidic damage”. If you want to use a citrus essential oil in your granite cleaner I recommend you contact the companies product support to double check that their oils are non-acidic.